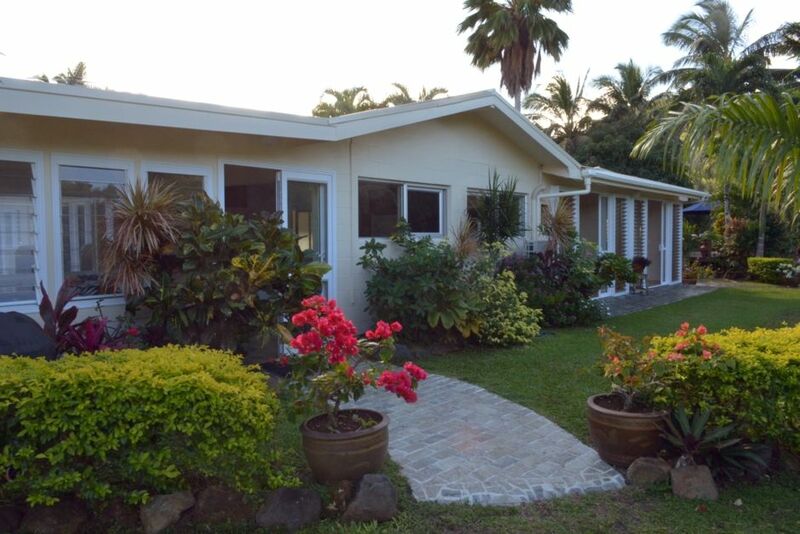 Located on the south side of the Island down a driveway and set amongst landscaped gardens, this well maintained family home allows open living with ample space for relaxing from any room in the house. French doors from the lounge and bedrooms open to a garden of native tropical plants creating an ideal setting to unwind and put your feet up. The home provides accommodation for up to 8 guests. It features a fully equipped modern kitchen, dining area and lounge, 4 bedrooms each with air-conditioning and screened windows, 2 bathrooms and an adjoining laundry area. There are several options for outdoor dining on the property with BBQ facilities available. Private beach access across the road offers an alternative seaside retreat for swimming, snorkelling, kayaking and relaxing. Known for one of the least populated beaches on the Island the private deck complete with enclosed kitchen facilities, under-cover lounging area and day beds provides the perfect getaway to chill out and take in the stunning ocean view. Outdoor shower and BBQ facilities also available. Easy walking and short driving distance to cafes, restaurants and takeaways. Wigmore's, our village supermarket is open 7-days and is well stocked with a huge range of grocery items, fresh locally grown produce, dairy items and a complete range of organic products. Therapeutic and Sports massages including hot rock treatment can be arranged "at home" and at your leisure by our expert local therapists using traditionally made oil. Ask about the various spa, hair and beauty services on the Island, an appointment can be arranged for a convenient and suitable time. Quiet gatherings only. Would appreciate that property not be used as a venue for group functions or parties. Spacious family accommodation, suitable andamp; safe for children. Vouchers are available from Bluesky outlets including the Airport on arrival. The house is beautiful appointed and if anything prettier than the pictures. Everything you need is right there and Connie provides you with the basics to get started. The house and gardens are stunning and were perfect for our two families with little ones. It was impeccably presented and maintained and Connie and family were such great hosts. The beach hut was so well equipped and we enjoyed using the stand up paddle boards and having a fire on the beach there. The beach there is stunning and it's fun to watch the organised tours go out to see the turtles in the nearby passage. Definitely something we'd like to do next time. Thanks again! This property was perfect for us. Spacious home with lots of different seating areas, and a beautiful garden to enjoy. Having access to the 'beach house' across the road made all the difference. A huge deck shaded with big trees, water lapping at the steps, kayaks, snorkeling gear and a SUP to use. Fantastic. We hope to be back some day! Nice and close to Wigmores Supermarket too which is very convenient.